When we bought Indigo, a very old West Marine inflatable, the kind with thin fiberglass floor slats, came with the purchase. It has worked for awhile but leaks just enough to be annoying and due to the old slats breaking every time you stood on them, very unstable when sitting or standing. Also, it is made of PVC and will not stand up to constant UV rays. In other words, It just won't do. 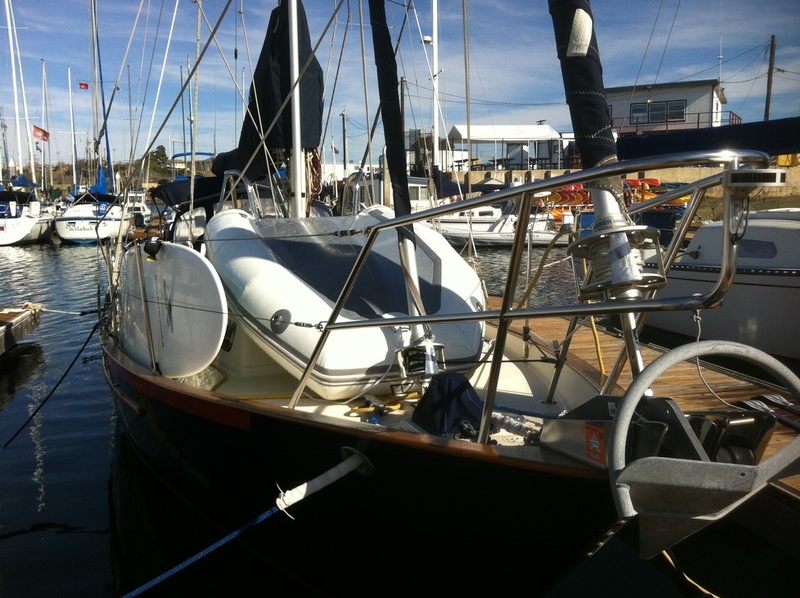 The dinghy question has long been a source of consternation - we have looked and pondered long and hard about which to settle on. This I think is the operative word as we can't have nearly what we want, as with most things, and there are soooo many choices and factors involved, like placement and size, it was not a fun thing to determine. Roll-up slat-floored types were ruled out of course. The larger aluminum slatted floors were also ruled out as we did not want to mess with removal of those huge pieces. So we looked at small rigid inflatables, inflatable floored (otherwise called air floors) and fully wooden or fiberglass nesting kinds. For a while, we thought about a nesting dinghy. 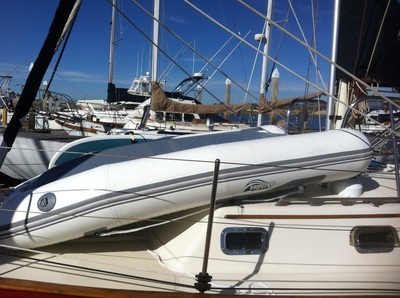 Wanting it to sit flat, the only spot is on the cabin top, not on the foredeck. Working around the solid boomvang and 2 mast pulpits leaves only a few usable feet and we just couldn't find anything that fit. We looked briefly at a small aluminum RIB (rigid inflatable boat) but it was just too large for the foredeck, we thought we might be able to fit it if we fully deflated it but the specs didn't exist for that length and while we measured it manually (while inflated) we just didn't think it would work (width-wise too). We have heard wonderful things about RIBs, and if I had a bigger boat I would have considered that one very heavily as it has 17" tubes and 3 air chambers (2 is standard, 3 is a better design I think). We finally waffled between the air-floor Achilles LSI-260 at 8'6" and the LSI-290, a foot longer at 9' 6". With the extra foot the 290 came with 17" tubes rather than the 15.5" tubes. We REALLY wanted the 17" and the longer length. Everyone says to get the biggest dinghy you can afford. At only $100 more, the price wasn't an issue. It really came down to the fact that to get it to fit, we would have had to partially deflate it every time we wanted to put it on deck. We plan on taking it out of the water every night so it doesn't get stolen. Leaving it in the water just makes it easy for thiefs... cut the line and row away. The theory is if it is on our boat, the likelihood goes way down that someone climbs aboard to steal it, especially if we are sleeping right under it. So it came down to the Achilles LSI-260. We purchased it and tried it out over the holiday weekend. 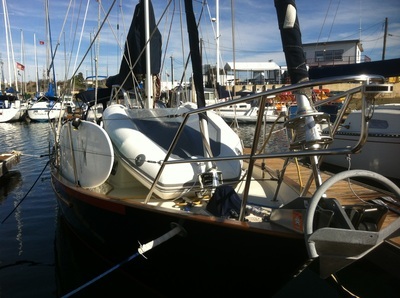 It fits perfectly between the forestay on the deck and the mast pulpits when inflated. We will be able to just get in the "car" and go, no fuss, no muss. The only thing I am hoping I won't regret is the smaller 15.5" tubes. I know the 17" are better for not getting wet but I figure I'm already used to smaller tubes and that getting a little wet will be inevitable anyway. However the smaller beam due to the smaller tubes means we can easily walk around the dinghy up on deck while inflated to deal with anchoring, etc. 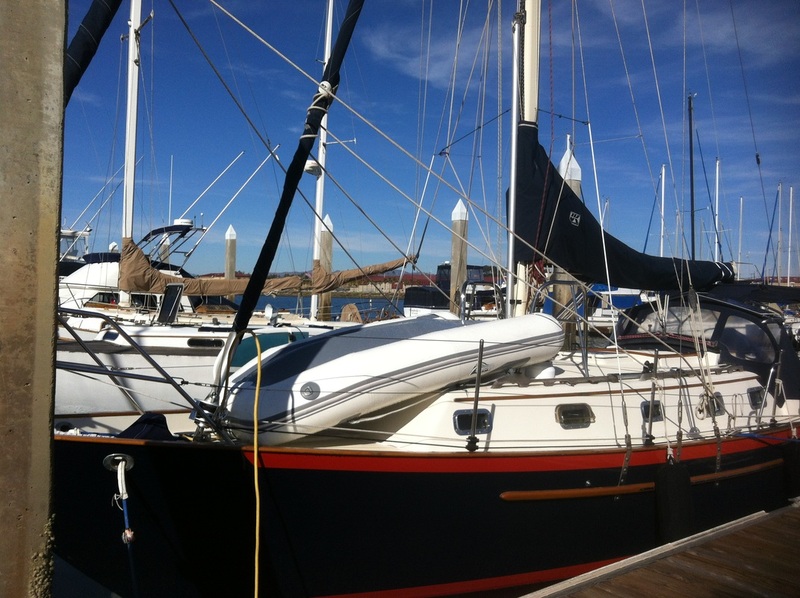 And as a bonus, our high-cut staysail tacks over it perfectly in case we want to leave it inflated for short hops. The air-floor is the BEST. It feels like you are sitting on a firm cushion and feels stable when standing. Any water spray that comes in the boat travels down under the inflated floor into the "bilge" and keeps the bottom of the boat puddle-free. I think if you can't have a rigid, the air-floor is awesome. I bought the white version mostly because it was in stock. The grey has a bit of stippling to the material but seemed smoother. The white has no stippling but with a sticky rubbery feel, so it seemed to me it would not be as slippery to sit on. TBD. That may be wishful thinking. Stowed Dimensions: 3'-5" x 1'-8" x 11"
Fully inflated. Lots of room still on deck. The paddleboard is for sale! 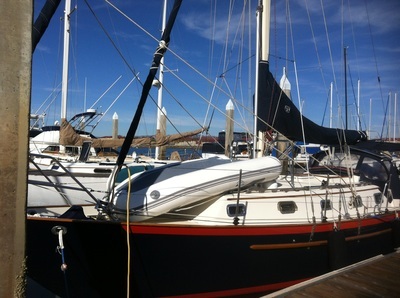 Fits with no room to spare between the stay and the mast pulpits.